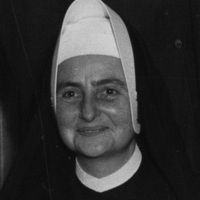 Sister Jean Dolores Schmidt, BVM, circa 1960. 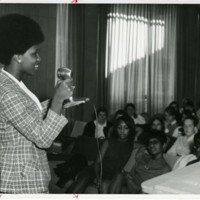 Listen as Jean Dolores Schmidt, BVM, faculty member, and administrator at Mundelein College, describes the on-campus leadership exhibited by student Diane Allen during the tumultuous Civil Rights Era. 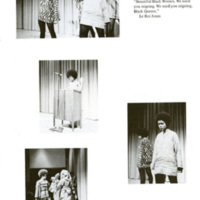 The Mundelein College Black Students Association in the 1970 Yearbook. Diane Allen speaks out about black problems at a white college, 1968. "Subtle white barriers segregate minority groups, says Diane Allen," Skyscraper, October 4, 1968. 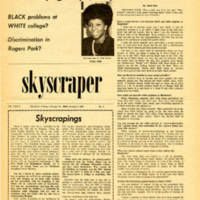 "'Black community evolves with new consciousness,' says Diane Allen," Skyscraper, October 11, 1968. 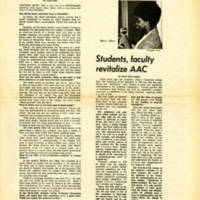 While the student body engaged in the Civil Rights Movement by publishing newspaper editorials and planning campus speaker series, a group of African-American students remained discontented with the underlying motives of their peers: to eradicate the nation of Southern racism and segregation. Black Mundeleinites created their own sense of community on the white campus. As part of their extracurricular activities, a group founded MuCuba, the Mundelein College Black Students Association, to create a safe space on campus to decry institutionalized racism and cultivate an on-campus black culture. From this same movement rose Diane Allen—a sociology major and new student leader—who spoke out against the barriers for black students at white colleges and, specifically, at Mundelein.